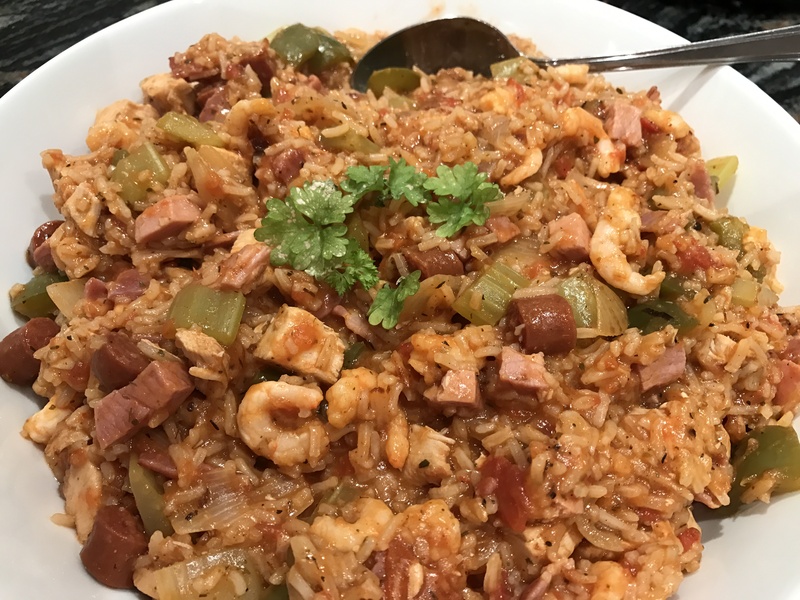 I hadn’t made Jambalaya for years and years – too many to remember! Not sure what but something jogged my memory and I decided to make it as I knew my husband would love it with its mix of ingredients and warm, spicy taste. I have never written recipes in a book, but have kept scraps of paper, cut-outs from magazines, notes written on serviettes, recipes from my grandmother and mother-in-law, all in a folder; some of which by now must be fifty years old! Deep down, there was a recipe for Jambalaya written in my handwriting from a very long time ago. The only update I did was to buy some Cajun seasoning rather than blend my own spice mix. Heat a large pan over a medium heat and add bacon. Cook until crispy then remove it and put to one side, leaving any bacon grease in the pan. To the same pan, add the celery, pepper and onions and cook until tender. Add the ham, chicken, sausage, tomatoes, stock, herbs and Cajun seasoning. Bring to the boil and add the rice. Cover and simmer for at least 30 minutes until the rice is tender. You may need to add a little more stock here if it looks too dry. Once the rice has cooked, stir in the bacon and prawns and heat through thoroughly before serving. 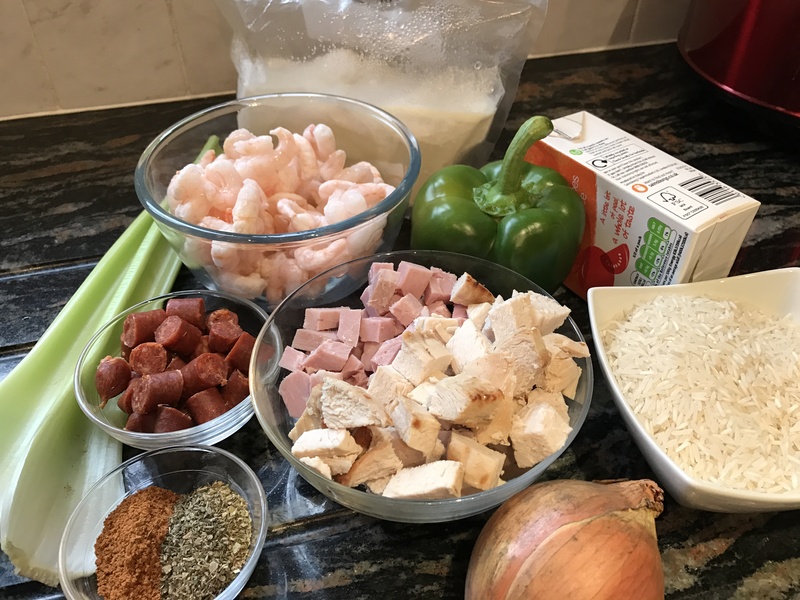 This entry was posted in Dinner and tagged Bacon, Cajun, Celery, Chicken, Cooking, Dinner, Gluten Free, Ham, Peppers, Prawns, Smoked Sausage, Supper, Tomatoes, Wheat-Free. Bookmark the permalink.